I have Thai Vesuvius coming ripe now that we'll start picking and drying. Nice! Funny how it seems that there is no rhyme or reason to which peppers come first and when they ripen. 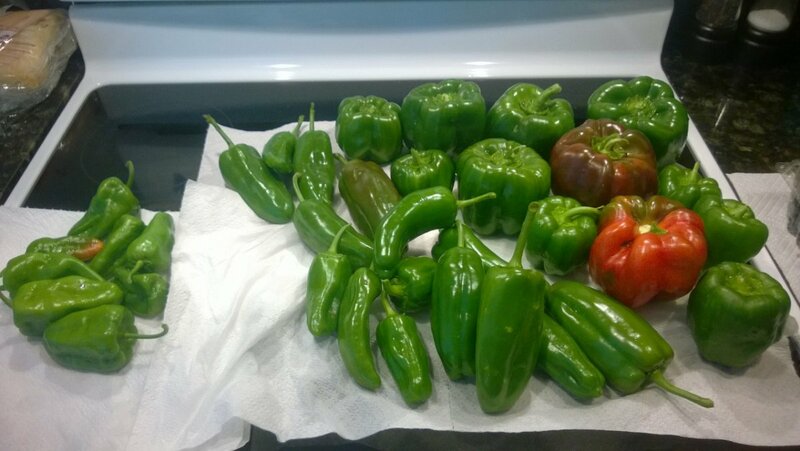 Here, we've been getting serranos and padrons in profusion for about two months, the sweet peppers are just ripening, and we don't even have a hint of a ghost pepper! They say that this Summer, the weather here has been about 10 degrees cooler than normal, and I hear that ghost peppers are hard to grow here when the weather is normal, but its still surprising that the padrons and serranos came so early. But it looks like you have it all - and quite the haul too. Peppers are susceptible to blossom drop, too. Maybe it had been too hot or too humid? ...what do you eat Pepper Jelly with? Sometimes I get caught up in the excitement and make these preserves and stuff, and then end up saying. O..K... Now what do I do with this? applestar wrote: ...what do you eat Pepper Jelly with? Well, we give a few jars away, and basically do two things with the jars we keep. 1) serve it over softened cream cheese and use it as a "dip" for tortilla or corn chips, and 2) use it in crockpot sauces for things like cocktail weenies, meatballs, etc. If you've ever seen someone use grape jelly in that capacity, same idea. It makes the sauce silkier, and adds a little heat and pepper flavor. You had me at "Fritos." Drop some of those peppers into a food processer with a bland type of cheese like mozzarella then melt on bread, on a pizza on nachos or any recipe that calls for melted cheese. This works especially well with mild peppers. It's something my mother improvised that you don't see in recipes or restaurants but is incredibly delicious.